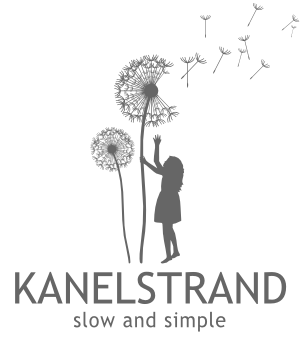 Since its beginning 15 months ago, A Portrait of the Artist has always been about meeting you with great talent from around the world that is infused with love to nature and is based on appreciation and care to the Earth. Today I am proud to share this space with an artist who touched my heart in a primitive and unforgettable way. 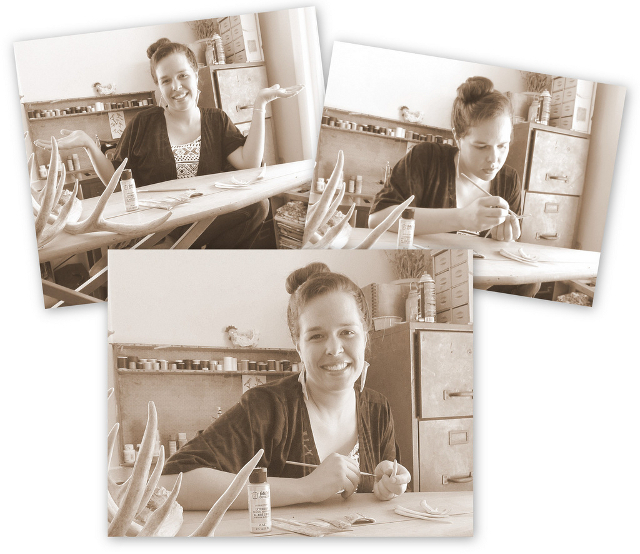 Charity of JC McCairn creates outstanding naturally shed elk and deer antler hair combs, hair sticks and shawl pins. I imagine this lady like fairy-tale like creature who can talk to elks and feels the Earth vibes. The wisdom she shares about creation and existence resemble the Thoreauvian principles of simple and purposeful living. Her unique, eco-friendly items reflect a simple, rugged aesthetic that brings the wild outdoors into your daily life and conjures up thoughts of our ancient heritages. Charity believes in hunting deer for food as an important part of their population management and for the benefits of lean wild meat for people, and especially children. 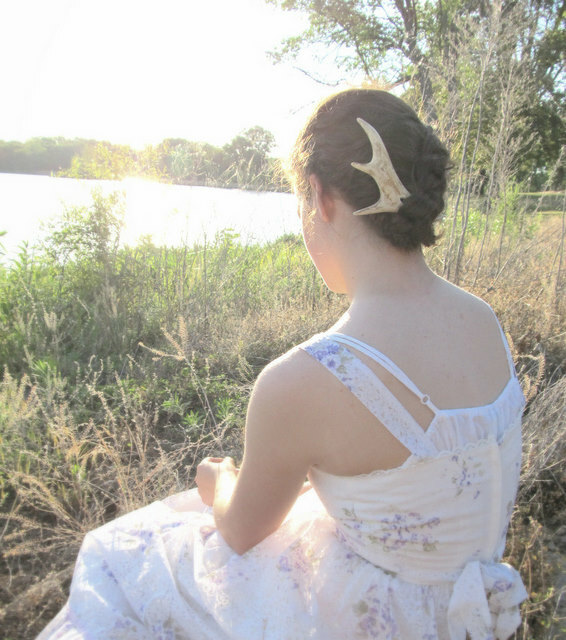 In her unity with nature she has found out that the naturally shed antlers are like scattered treasures in the woods for her to find and utilize. "The underlying motivation in what I do is to bring people closer to their Maker by showcasing His raw artistic creation through the beauty of antlers." You have found an extraordinary way to prolong the life of a discarded antler and put it on a human head - reborn in almost the same role but on a different kind of head. How do you think this affects the wearer? When I put an antler comb in my hair it’s like being instantly swept away to another time and place. Sometimes I imagine myself roaming the wild forest, tasting the freedoms that the deer themselves experience. Other times my antler carvings help me connect with my ancient ancestors (specifically for me the Native American and Celtic cultures). Whatever the adventure they inspire, my pieces are symbols of freedom, strength, dignity, grace and raw beauty. I see "harvesting" or "hunting" for antlers as an integral part of your creative process. Can you describe to us both processes? Finding antlers can be tricky not only because they are camouflaged but I also have to find them before the forest critters carry them off to gnaw on. My family has a lot of land for me to search but even then I have to buy or barter for most of my antlers. My creative process begins when I see the structure of each antler and start thinking of what I can make out of its unique shape. I then start cutting. When I have the shape I want cut out, I start the long sanding process to make it smooth enough to slide through your hair. The final step is coating the piece with sealer. I usually work in small batches and it takes around three days to a week to finish a batch. Because I have three kids ages three, two and four months, this process takes place early in the morning or late at night when the little guys are asleep. The dust formed from cutting and sanding antler smells atrocious and is harmful to breathe so I wear a high quality respirator and safety glasses. Tell us about the place where you live. It must be amazing to be in such close proximity of elks and deers! In what way has this changed your perspective on life? I adore where we live! We have two and a half acres of our own with a few farm animals, a barn and a pond. It’s surrounded by small farms, rolling hills and wooded areas. We enjoy gorgeous sunsets and raising our kids in such a peaceful place. Living here has taught me to crave the serenity of nature and to be as self-reliant and resourceful as possible. 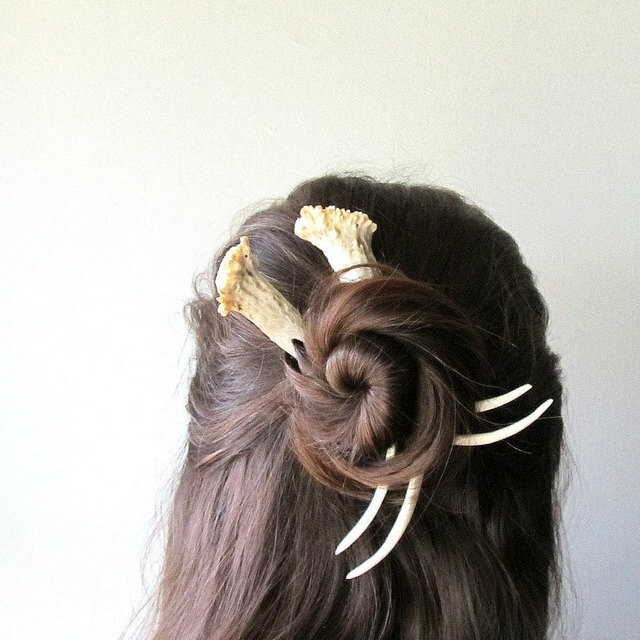 How did you first get the idea of turning antlers into hair accessories and how has your style developed? My husband makes beautiful custom knives with antler handles and he put the bug in my ear to make buttons or something with the pieces he cut off and didn’t use. When I joined him in his workshop and took a closer look at the elegant curves and unique textures of antlers, I was smitten by their beauty! I immediately asked him to teach me how to carve them into the creations I was picturing in my head. I love playing around with hair and when I first thought to make a hairpiece from antler it was such a perfect fit, I could almost hear dramatic theme music playing in the background!!! What are the differences between elk and deer antlers? How do you make use of those differences? Elk antlers are usually lighter weight but larger and have a lot of bumpy texturing, which is a great fit for large dramatic hair ornaments. 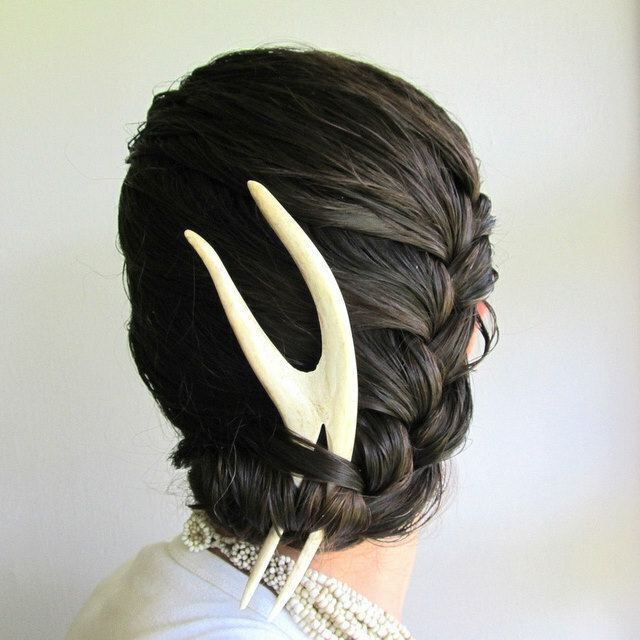 The deer antlers are practically indestructible which makes them perfect for hard working hair sticks. I also like to use their forked tips for hair ornaments because they are easily recognized as deer antlers. What is your greatest inspiration and do you find it changing with the years? The specifics of what I create are ALWAYS changing and evolving but the inspiration remains the same. For as long as I can remember I have loved taking something cast off and giving it new life. I think God placed this desire in my heart to give me a living picture of how He feels about me. Just like I search for antlers, He searched me out when I was broken, lost and fallen so that He could rescue me, shape me and breathe new purpose into my life. How do you make sure you are earth-friendly in your work? I think my work forms a tender bond between people and nature which helps educate people about the beauty of God’s raw creation. What is your way to live in peace with nature? I like to view nature as a gift from God that is meant for our use, to sustain and enrich our lives. I try to use common sense to keep a healthy give-and-take balance in my interactions with my environment. What is your current favorite item by another etsy member? That is such a hard question because I love so many things on etsy!!! 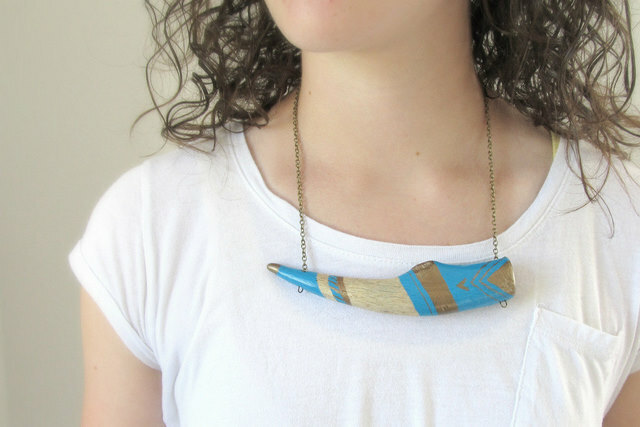 I’m loving pieces like this from Seashore Love. 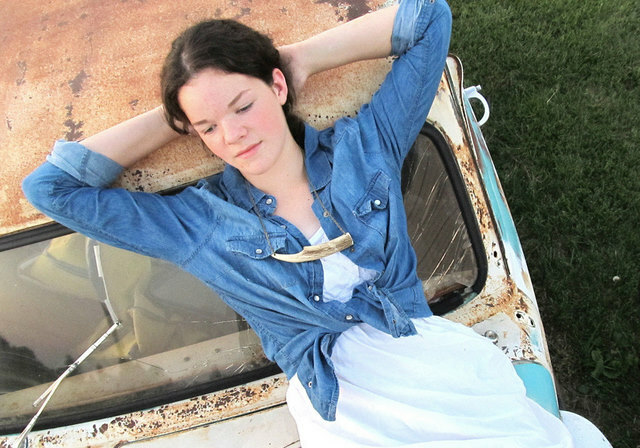 She uses seashells and driftwood to make jewelry in a similar spirit as what I do with antlers. I used to live on a Caribbean island and I LOVE and miss the beach!! what a wonderful interveiw and a really special artist!! LOVE the natural beauty !! this is awesome, i love this feature! amazing! I love her hair accessories, really one-of-a-kind.